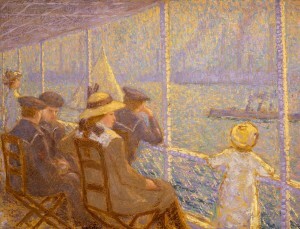 This is one of three paintings MacRae exhibited at the Armory Show; the others were New York Yacht Club at Newport (unlocated) and Fairy Stories (Parrish Art Museum, Southampton, New York). He also showed a selection of drawings and pastels. We are indebted to Susan G. Larkin for providing information on this painting. The Excelsior Diary, 1912, MacRae Papers, Box 20, folder 207, Archives, Greenwich Historical Society, Greenwich, Connecticut. Susan G. Larkin, “’So many thrills, so much excitement’: Elmer MacRae’s Role in the Armory Show,” in The Armory Show at 100: Modernism and Revolution, Marilyn Kushner and Kimberly Orcutt, eds., exh. cat. (New York: New-York Historical Society, 2013), 73.